I bought some huge split chicken breasts for dinner tonight. They were the Smart Chicken brand, which I like because the chickens are raised without the use of hormones, animal by-products or antibiotics. The quality is great and the chicken tastes really fresh. I knew I wanted to grill them with some sort of glaze, and went with an orange-tomato based marinade. The result was really good and will be my go-to chicken marinade from now on. I served it with some fresh corn on the cob brushed with an herb infused butter. In a saucepan: bring brown sugar, orange juice, tomato sauce, soy sauce, worcestershire sauce and garlic to a boil. Stir to dissolve sugar. Simmer for 5 minutes then let sauce cool. Reserve about one cup of the glaze for basting later on. 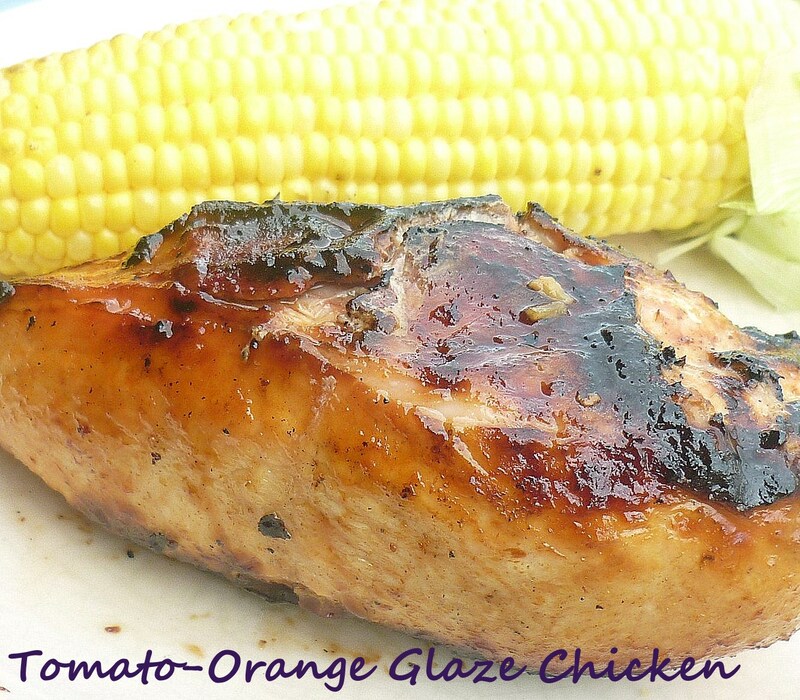 Place the chicken breasts in a dish and pour the rest of the glaze over them. Cover and let marinade in the refrigerator for a couple of hours. 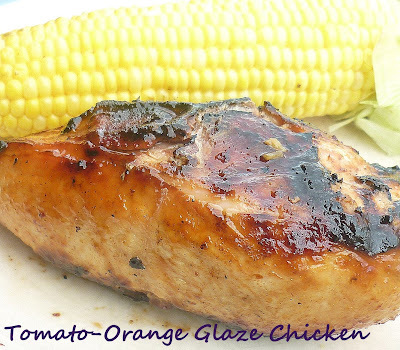 Place chicken on the grill and cook for about 10-15 minutes per side, depending on the size of your chicken breasts. A few minutes before the chicken is done, brush some of the reserved marinade over the chicken and finish cooking. Chicken is done when juices run clear, or an internal instant read thermometer reads 170 degrees. I only cooked two chicken breasts, and there was plenty of marinade left over, so this would probably be enough for 4 breasts. Melt the butter in a saucepan and add the fresh herbs. Let simmer for a few minutes, then reduce heat and cook for about 10 minutes. For Corn: Peel back husks from corn, but leave intact, and remove strings. Brush herb butter over corn and then pull husks back up over the kernels. Place over indirect heat on the grill, and cook for about 20 minutes, rotating as needed.